But now the reports are that Rosenstein will stay until the Mueller/Trump report is handed up…. That could be as early as March and as late as the summer since the Mueller Grand Jury has been extended for 6 months…. It should be noted that Acting AG Whitaker has NOT touched the Mueller efforts and Barr has told Sen. Lindsey Graham (R-SC) today that he won’t either…. Deputy Attorney General Rod Rosenstein, who had been overseeing the special counsel investigation, plans to step down after Robert Mueller finishes his work, according to administration officials familiar with his thinking. But others familiar with his thinking said there’s no firm timeline and that Rosenstein would work out a departure plan once the new attorney general is confirmed and on board. Rosenstein had long intended to serve about two years as the Justice Department’s No. 2 official, the administration officials say. They add that this is his own plan and that he is not being forced out by the White House. That’s despite the fact that he’s been a frequent target of criticism from President Donald Trump on Twitter. 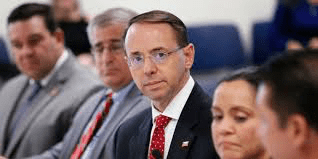 The administration officials had said that Rosenstein planned to remain on the job until a new attorney general is confirmed….